NEW! 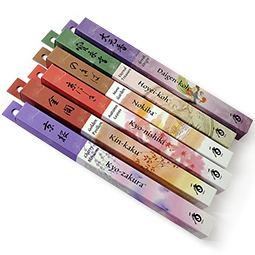 Save 10% off the price of all five incense when you purchase them together in this assortment! Presenting five Shoyeido best sellers, each ready to lend an aura of comfort and conviviality to year-ending — or beginning — festivities! Assortment contains one bundle each of five best selling Shoyeido fragrances (click on each incense to learn more about it): Joy, Creativity, Emerald, Overtones: Frankincense, and Golden Pavilion. This assortment is not available to wholesalers.